North Beach Plantation is a high-class North Myrtle Beach resort that is as wonderfully suited for families as it is romantically captivating for couples. From this North Myrtle Beach resort’s Georgian architecture to the Caribbean-themed, 2.5-acre oceanfront pool deck, North Beach Plantation is a haven for world travelers and prime destination for a Myrtle Beach vacation. 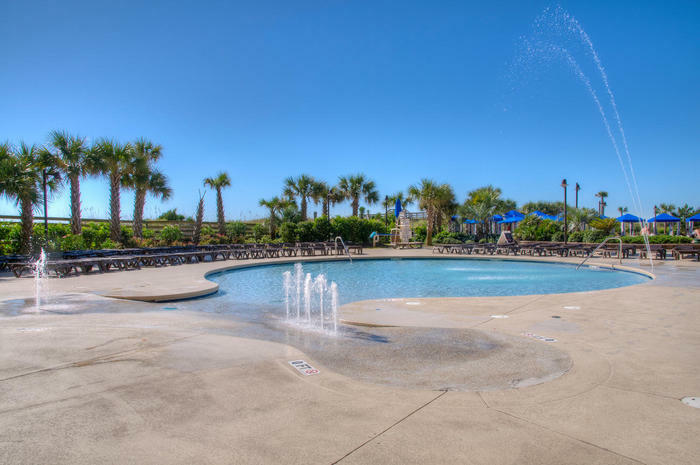 North Beach Plantation is a grand inspiration that rises out of the North Myrtle Beach landscape and brings the very best to your family for your North Myrtle Beach vacation. This North Myrtle Beach resort is a marvel of beauty inside and out. From the moment you arrive at this luxurious retreat you can see and feel the opulence. North Beach Plantation raises the bar of excellence with its North Myrtle Beach condominium rentals, oceanfront pool deck and on-site amenities that include the Cinzia Spa. This North Myrtle Beach resort is built on a 7.5-acre island between White Point Swash and the Atlantic Ocean. North Beach Plantation is comprised of a pair of oceanfront, high-rise towers that are connected by an architecturally interesting arch. An adjacent parking garage provides six stories of parking and ease in getting to your North Myrtle Beach vacation rental at North Beach Plantation. This North Myrtle Beach resort’s driveway is beautifully landscaped with a nicely manicured lawn that surrounds numerous water fountains. Welcoming from your first glimpse, this North Myrtle Beach resort promises a memorable beach vacation for everyone in your family. Sunbathing takes on a whole new meaning at North Beach Plantation where the sun deck of this North Myrtle Beach resort sprawls toward the Atlantic Ocean. Step outside of this North Myrtle Beach resort and into a wonderful oasis of poolside recreation that glistens in the sunshine. At North Beach Plantation the pool area is nearly three acres. The oceanfront sun deck wraps around elaborate swimming pools and includes waterfalls and water fountains. The infinite swimming pool overflows into another swimming pool and the 6-inch deep lounging pool is designed to be enjoyed as you relax on your lounge chair. Bask in the sun while letting your feet dangle in the shallow water, just like having a beach chair on the beach. Order your favorite frozen cocktail from the swim-up pool bar and take pleasure in your pina colada around a private table and seating that are in the pool. Chairs and shelters are scattered all around the pool deck so there is plenty of room for North Beach Plantation guests to enjoy a day at the pool with their family. Another feature of the pool deck at North Beach Plantation is the cabana service that is available. This stunning tropical paradise clearly resembles a world-class resort you might find in the Caribbean. Elliott Beach Rentals is not affiliated with onsite management or the HOA of North Beach Plantation Indigo Tower.